Coupled with our supercomputers, Delta Search Labs utilizes an amazing tool for analysis: the first commercial digital CAVE®. 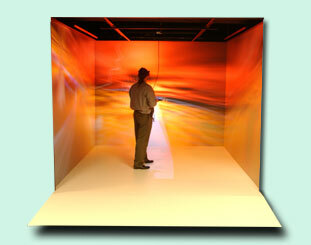 Our CAVE® is fully immersive virtual-reality cube for visualization of computational data, interactive, full-scale scene viewing and simulation of real-world phenomena in startling visual stereo clarity. It allows one to create and test prototypes of products virtually. This maximizes the accuracy and performance of the product, eliminating cost to build physical prototypes. Driven by our SGI supercomputer, the CAVE® provides four display surfaces of bright, digital images, full digital stereo audio, and complete 3-dimensional operator tracking and image adaptation for unprecedented insight of complex data sets unattainable with single-screen displays. It allows teams of several people to comfortably immerse themselves in the same virtual environment at the same time. While performing complex simulations, the user can see changes in seconds. Our computing and visualization infrastructure provides a unique environment for solving and visualizing some of the most complex problems facing science and business today.